A Warren Moon personal appearance, Warren Moon speaking engagement, or Warren Moon endorsement will reflect well on your company. To hire Warren Moon now for any corporate appearance, fundraiser, motivational speaker event, personal appearance, autograph signing, or website endorsement please contact our celebrity agents at 1-877-6-SPORTS. We will contact Warren Moon or contact Warren Moon's agent and provide you with the booking fees and availability immediately upon your request. Direct Sportslink is the only sports speakers bureau and talent booking agency based in the United States securing only sports talent for corporations, associations, and organizations for motivational speaking engagements, personal appearances, and endorsements. We are the premier sports celebrity booking agency and a sports celebrity procurement expert. Accordingly, we will provide you with any relevant Warren Moon website information and booking agent details so that you can hire Warren Moon for your next event. Warren Moon led the Washinton Huskies to a 27-20 win over the favored University of Michigan Wolverines in the 1978 Rose Bowl and was named the game's Most Valuable Player. Despite his collegiate success, Warren Moon went undrafted in the the National Football League. Many pundits believe that it was because Moon was black. With no takers in the NFL, his only alternative was the Canadian Football League. Moon signed with the Edmonton Eskimos, where he and Tom Wilkinson shared signal-calling duties and helped lead the Eskimos to an unprecedented five consecutive Grey Cup victories in 1978, 1979, 1980, 1981 and 1982. Moon won the offensive Most Outstanding Player award in the 1980 and 1982 games. In his final CFL season of 1983, Moon threw for a league record 5,648 yards. During his relatively short CFL career, Moon amassed amazing statistics: 1,369 completions on 2,382 attempts (57.4 completion percentage,) for 21,288 yards and 144 touchdown passes. He was inducted into the CFL Hall of Fame in 2001 and is also a member of the "Esks'" team Hall of Fame. He later switched ot the NFL and played for several teams, most notably the Seattle Seahawks. 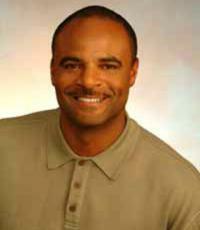 During his NFL career, Warren Moon was named to nine Pro Bowl games (1988-1997, 1997). He was elected into the Pro Football Hall of Fame in 2006, becoming both the first undrafted quarterback and the first African-American quarterback to be so honored. After his playing career, Moon has spent time broadcasting NFL games for the Seattle Seahawks. Based on your interest in Warren Moon as a speaker or for a personal appearance, Direct Sportslink has provided you additional links below for other sports talent with similar appearance fees, speaker topics, and categories that match Warren Moon.